HANOI, Vietnam — Vietnam has the second largest population of Catholics in southeast Asia after the Philippines. But things seem to be getting harder for the Church here. On Nov. 6, Cu Huy Ha Vu, a lawyer who sought to defend six recently-jailed Catholic villagers, was detained on charges of “propaganda against the state,” according to state TV. During the trial, the six, from Con Dau in central Vietnam, were denied a lawyer, after which Cu Huy Ha Vu told the BBC that the verdict was pre-ordained. It is not clear if there is any link between Cu’s arrest and his attempts to defend the six. But there has been a general crackdown on dissent in Vietnam ahead of the ruling Communist Party congress early next year. Prominent lawyers, journalists and activists have been arrested and jailed in recent months, while others remain under government surveillance. Speaking in Hanoi last week, U.S. Secretary of State Hillary Clinton said that the United States “remains concerned about the arrests, and the curbs on religious freedom in Vietnam,” before joining the country’s Deputy Prime Minister in extolling growing US-Vietnam trade and investment ties. The Con Dau 6 were among 59 people arrested after clashes between around 500 Catholics and government agents at the parish cemetery of Con Dau in May. Catholics had conducted a funeral procession for an 82-year-old woman and tried to bury her in the cemetery, which had been seized by the local government to build a tourist resort. 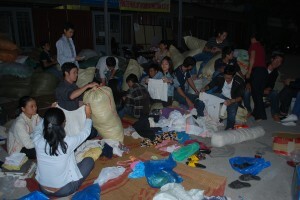 Vigils for the detained were held in Hanoi and Ho Chi Minh City, where people listened to a letter from Bishop Paul Nguyen Thai Hop, the president of the Vietnamese Bishop’s Peace and Justice Commission, which challenged the legality of the government’s property seizure. He asked why the government is “pushing the peaceful Con Dau parishioners into current tragic situation, causing one death, many arrests, others facing total loss of properties.” Forty of the villagers fled to Thailand after the incident, where they are seeking refugee status. Le Quoc Quan, a parishioner at Thai Ha, was himself previously detained for three months, shortly after he returned to Vietnam in early 2007. A lawyer, he had been on a five-month fellowship in Washington at the National Endowment for Democracy. “I am not afraid,” said Le. have been whittled down to 1/14 of the 1954 area, when the country gained its independence from France. 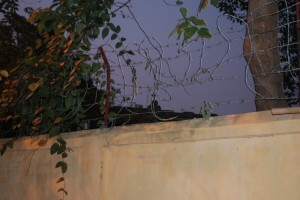 As this reporter walked with a parishioner outside the church grounds during rush-hour, edging though a narrow side street jammed with the crisscrossing tide of scooters and motorbikes taking commuters home from work, he was told that one should be wary of government agents keeping an eye on the church. “They have surveillance around here,” said the parishioner, requesting anonymity. The reporter was told that the government wanted a newly-opened, U.S.-government-funded methadone clinic placed beside the church to increase the psychological pressure on the parishioners. “The idea is to make people uncomfortable by having many drug addicts hang around at the church gates,” said Le Quoc Quan. One of the parish’s Redemptorist priests, who requested that his name not be used, said that there are other ploys being used, such as state representatives handing out government propaganda close to church grounds. The official figures give a Catholic population of just over 6 million, but that is perhaps an understatement. 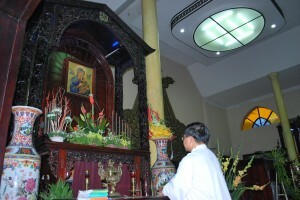 “Church figures estimate that there are over 8 million Catholics now in Vietnam,” according to the Thai Ha priest, making up around 10% of Vietnam’s population. Conversions in Thai Ha are on the upswing, as well, in keeping with the national trend. Thanh Chu, age 22, is one of 200 readying for her baptism, before she marries her Catholic fiancé.